April 5, 2019, 9:41 PM · A Who's Who of film composers and studio musicians from all over the Los Angeles area came out Thursday night to see violinist Sandy Cameron perform Danny Elfman's violin concerto, "Eleven Eleven," with the Royal Scottish National Orchestra at The Soraya at Cal State University Northridge. 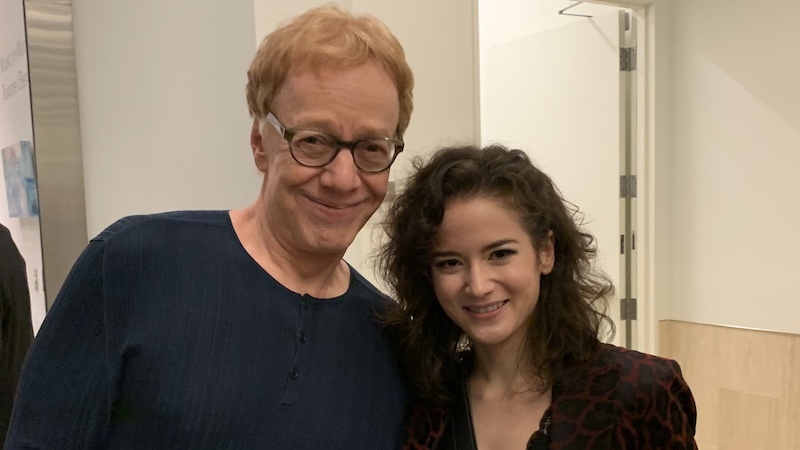 Composer Danny Elfman and violinist Sandy Cameron. I was aware that Cameron was touring with the piece (in fact I'd just featured her in our latest Week in Reviews), but it was film studio concertmaster Bruce Dukov (who has performed in hundreds of film scores including many of Elfman's) who convinced me that I definitely needed to see this performance, live. And it wasn't entirely because of Elfman; it was because of Cameron. "She's an amazing player, and she dances while she plays, and man, can she play. You have to see it!" he said over the phone. Indeed, this was something to see: Cameron proved to be a musician with the chops of a virtuoso violinist, the moves of a dancer and the charisma of a seasoned live performer. 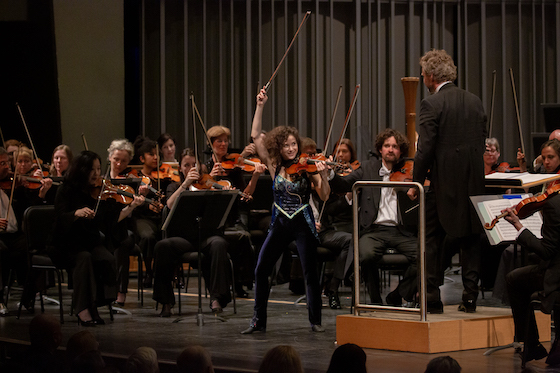 She first premiered Elfman's violin concerto in June 2018 at the Prague Proms, which co-commissioned the work with the Royal Scottish National Orchestra and Stanford Live. She also performed in a recording that released in March; here's the CD link and here's the Spotify link. You've undoubtedly heard the music of Danny Elfman, whether you know it or not. For one, he wrote that clever opening to The Simpsons (click on that and listen closely, have you ever noticed the intricate violin writing?). He also wrote film scores more than 100 films, including blockbusters such as Men in Black, Edward Scissorhands, Batman, The Nightmare Before Christmas, American Hustle, Spiderman - the list goes on. Elfman met Sandy Cameron because he wrote the music for Cirque du Soleil's Los Angeles show, "Iris," in which she performed. As he said in the program notes, "I knew I had encountered a rare and very odd creature: a concert violinist who had literally run away with the circus....I recognized right away that her abilities far exceeded the music I had written for her in that show." A Presidential Scholar and graduate of Harvard University and the New England Conservatory, Cameron has performed as a soloist with numerous orchestras and been involved with unique and high-profile projects like performing with Tan Dun's Martial Arts Trilogy; touring with Chris Botti; recording the violin solos for the video game Assassin's Creed: Syndicate; and playing as the featured soloist in Danny Elfman's Music from the Films of Tim Burton concerts. For her performance on Thursday, she wore a deep blue costume that combined the idea of an ornate bodice with tuxedo tails, paired with leggings and leather dance shoes. Was she a rock musician? A character from a Tim Burton film? A dancer? Somehow it all seemed to fit the occasion. Sandy Cameron performs "Eleven Eleven," a violin concerto by Danny Elfman, with the Royal Scottish National Orchestra. Photo by by Luis Luque. The concerto began low and spooky, with gorgeous sound coming from her violin -- a 1735 Pietro Guarnerius, on loan from the Stradivari Society. Her playing was emphatic, both physically and musically. The music went from a flowing line to something more like Prokofiev, punctuated with percussion and pizzicato in the strings. There were plenty of virtuosic passages, and she made them look like great fun, fingers flying and hair flying, too. When the soloist's music interacted directly with the orchestra, she physically turned to each section, as if personally passing around the musical line. A cadenza brought to mind the music of Ysaye. If her movements were sometimes angular, her sound remained perfectly smooth. The orchestration also had its own drama -- with second violins sitting across from the firsts. At one point I wondered, what's that sound? It was the double bass players, slapping their instruments as percussion. Cameron had impeccable pacing, and she played with her entire body: pointing a toe, whirling or crouching. Her movements seemed to grow organically from the music, never crossing the line into affectation. The second movement, called "Spietato" ("merciless"), was fantastical and cinematic, like a clock with wheels always in motion. It made wild demands on the violinist, with double stops that hopped all over the fingerboard, and she nailed them. In fact, this was one of the most committed performances I've ever seen, she clearly knew this music inside out, to the point of not just playing it but portraying it, as would an actor. Her awareness of the orchestra parts was like the awareness that a dancer would have, and at certain points when she was not even playing, she actually just broke into dance. The third movement ("Fantasma") began with a long orchestral introduction -- aching strings -- and for this she stood perfectly still, ceding attention to the orchestra. When she did enter, it seemed a little difficult for the solo violin to pierce through the thick orchestral sound. There were moments of poignancy and beautiful harmonies, and the end of the movement had its own kind of drama, a single beat from a very big drum, and then another, the toll of a bell, and pure silence. Was the piece over? It was not -- this violin concerto has four movements. In fact it derives its name from its length -- 1,111 measures long -- and the fact that the "Elf" in "Elfman" means "eleven" in German. It runs about 45 minutes long. The fourth movement, "Giocoso. Lacrimae," starts fast and playful, then gets dreamy. Cameron dramatized one orchestral climax by just standing there and thrusting her head backwards. The movement eventually winds into a giant apotheosis, with Cameron playing a series of big down-bows, rock-star style - and then she is left alone as it all floats back to the ground and her last note dissolves into niente. The audience could not wait for that silence, the applause began before she finished, and she received an enthusiastic standing ovation from the full house. While the violin concerto was what drew me to this concert, I enjoyed the rest of the concert immensely, particularly the RSNO's second-half performance of Symphony No. 5 by Prokofiev. The orchestra played with drive and precision, and for me the highlight was the second movement, Allegro marcato. Conductor Thomas Søndergård took it at a fast clip, and the orchestra hit it out of the park with an exciting and relentless performance.